This great snack was delicious, as well as addicting. Great dish, and also great for an after-meal if you don’t want a heavy dessert. Don’t let the spices scare you, the snack comes off as a sweet and salty taste. The recipe is from Cooking Light, December 2009. Yields 4 cups. Side note from the magazine: Store these almonds at room temperature for a week in an airtight container. Side note from me: After it’s been cooled for 5 minutes, make sure to go ahead and put them in a container, breaking up the clusters. If not, they will harden in the pan and you’ll have to chisel the almonds out. No fun in that. In a large bowl, combine 1 tbsp water and egg white; stir with a whisk until foamy. Add almonds; toss well to coat. 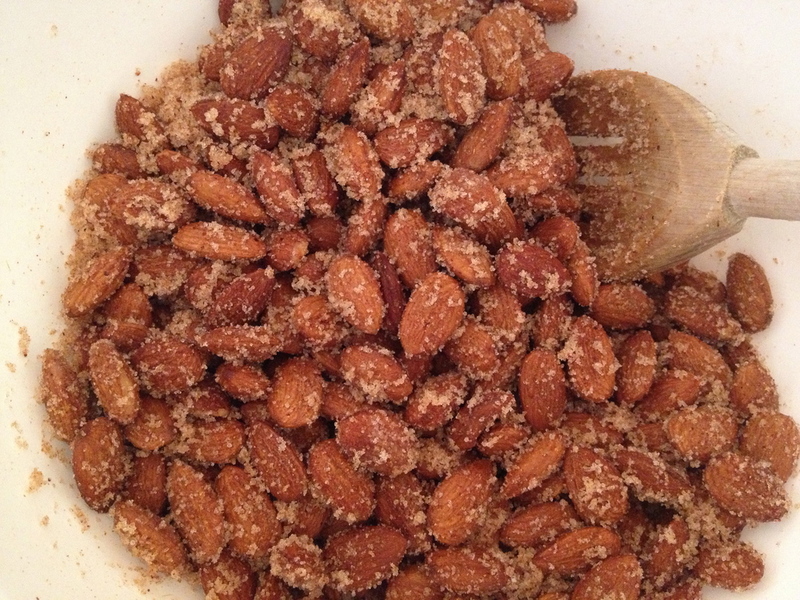 Place almonds in a colander, and drain 5 minutes. Combine almonds, sugar, and next 5 ingredients (through chili powder) in a large bowl; toss to coat. Spread almond mixture in a single layer on a jelly-roll pan coated with cooking spray. Bake at 300° for 15 minutes. Stir almond mixture; reduce oven temperature to 275°. Bake an additional 40 minutes, stirring every 10 minutes. Remove from oven; cool 5 minutes. Break apart any clusters. Cool completely.